Range: West Africa river regions. Habitat: Tropical -- Primarily found in the Niger and Conga Rivers. Diet in the wild: Flying insects, and some small fish.. 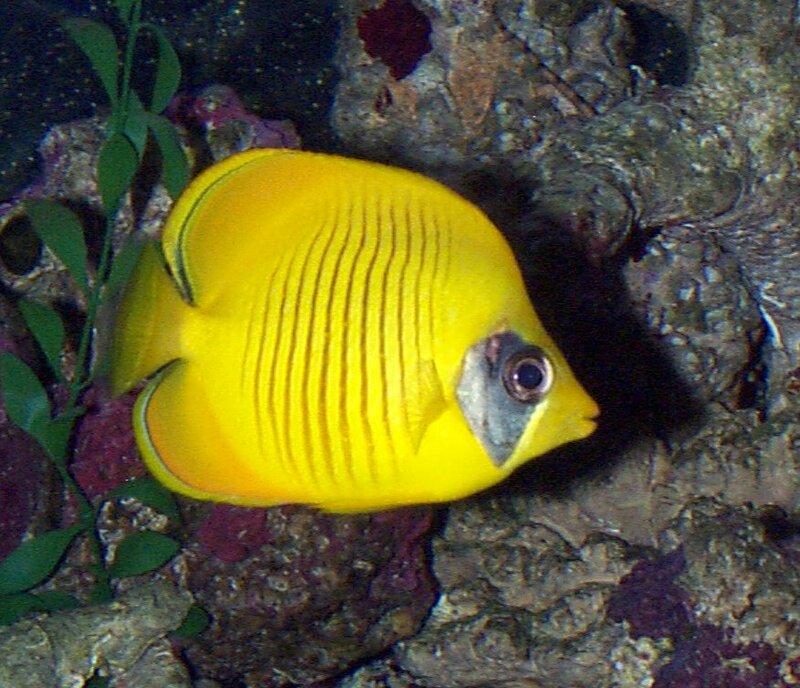 Growing to around 8 inches at maturity, the golden butterfly fish (Chaetodon semilarvatus) is one of nature's unique beauties. As the name implies, they are a golden yellow color. Their pectoral fins are enlarged and wing like. Their head and back are flattened, with the dorsal fin located far to the rear of the body. They have thread shaped elongated rays on their pelvic fins, which function as tactile receptors. 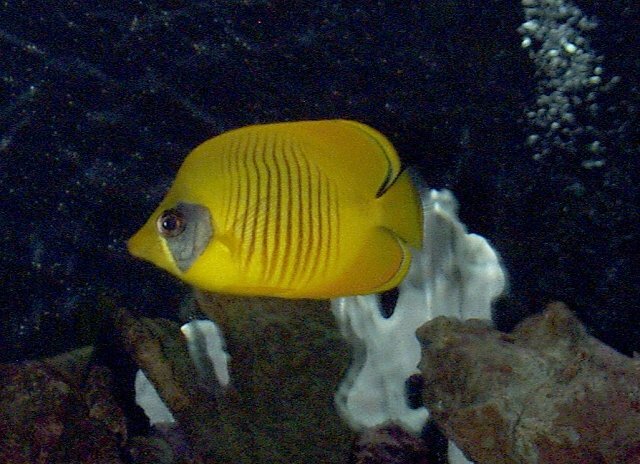 The scales of the butterfly fish lack ornamentation, however they appear to have tiger like stripes growing vertically along the middle of their body. Given the scientific name Chaetodon -- "bristle-toothed" -- the tigerish appearance may be warranted, and indeed these attractive fish are predators. The large pectoral fins of the butterfly fish allow them to "jump" up from the water and through the air, giving them the appearance of flying, thus the name "butterfly." The butterfly fish is generally found floating at the top of the water where it appears to hang from the surface. This makes it convenient for them to reach their food supply, which consists mainly of flying insects. To an insect that suddenly finds itself the prey of a golden fish charging out of the water, the fish may look more like the tiger its stripes suggest rather than a butterfly. These fish are normally found in pairs, although in captivity, it is suggested that they not be kept in the same tank unless one is much smaller than the other. Some species appear to be monogamous. Courtship is enthusiastic, ending with mating at dusk. Butterfly fish are egg-layers, and the eggs develop free in the water without parental care. 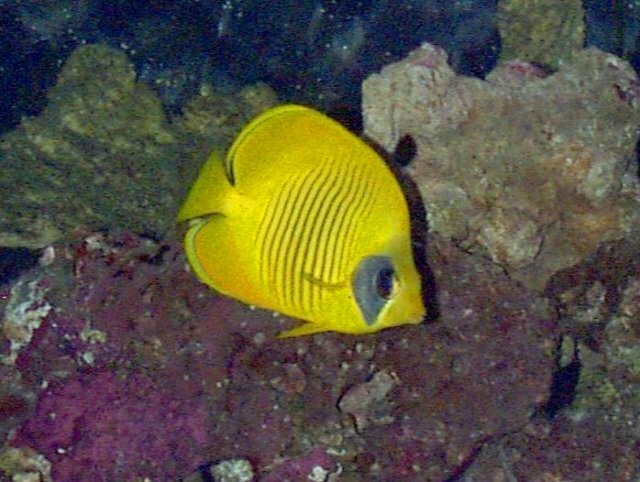 In many species of butterflyfish, the young are a different color from their parents. The young larvae are of a type unique to butterflyfish -- "tholichthys larvae" -- and look much like small insects themselves. The head is armored, with plates projecting from the head toward the back. These larvae grow to a few centimeters across and then transform into a tiny miniature of the adult. The very large "wing" like pectoral fin of the butterfly fish makes it easy for it to leap out of the water to catch flying insects. In its natural environment this species would be found in pairs, and would be "hanging" up near the top of the water. Notice its reflection as it hangs near the top of the tank. The butterfly fish found at the Fort Worth Zoo is kept in a tank alone. In captivity it has habituated to its tank, and therefore does not attempt to stay at the top of the water. Other reasons for this could be that it does not have to seek flying insects for food, and that it is unable to leap out of the water, therefore preferring to swim around at leisure in its tank. The tank is close to Penguin Island, located on the right as you descend down the ramp. The golden butterfly fish is one of the most beautiful to be found in the aquarium of the Fort Worth Zoo. It does not move around a lot, but rather seems to just float through the water. Golden Butterfly Fish. Mudminnow Information Service. Grzimek, Bernhard H. C. Grzimek's Animal Life Encyclopedia.4th edition: Fish. Van Nostrand Reinhold Company: New York.